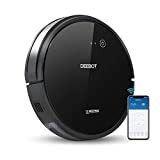 Ecovacs is one of the best-selling robot vacuum brands on Amazon because it’s Deebot line of robotic vacuums offer unprecedented bang for the buck. If you haven’t yet gotten in on the action or if you’ve been waiting for the right time to upgrade, you’re definitely in luck today. An Amazon has dropped the price of the $300 ECOVACS DEEBOT 601 Robot Vacuum Cleaner to just $255, but we’ve got an even better deal for you. Use the coupon code 7FP7NIFA at checkout, and you’ll pay just $194.98! 1-Year Warranty, plus accessories: 100% money-back guarantee. Includes (1) main brush, (2) side brushes, (1) docking station. Note, we can not guarantee after-sales service to customers outside the United States.